I enjoyed my time in university. Well… mostly. I always dreamed about visiting the most prestigious schools around the world and spontaneously attending classes in different topics. It’s just a dream, I said to myself after looking into tuition fees, lodging and travel costs. Who would have thought that the most renowned universities would come out looking for me and offer me courses for… FREE! Well not only for me. This is available to you too my dear reader. 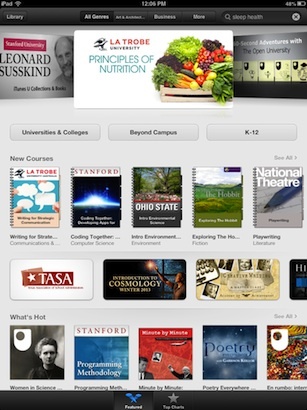 The iTunes U App offers complete courses in a variety of subjects (e.g., business, psychology, finance, chemistry, math, astronomy, computers, etc) from universities around the world. 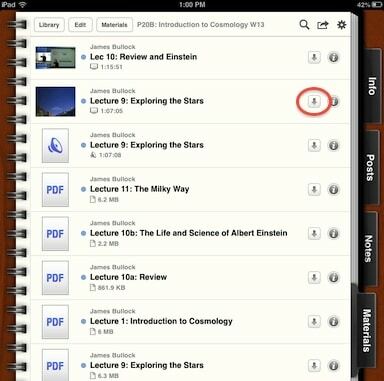 iTunes U is produced by Apple and is free but it is not part of the standard applications that come with iOS on iPad. 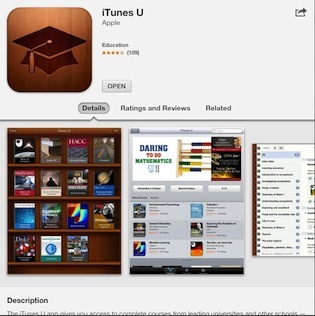 You can download iTunes U by following How to download and install iPad Apps. 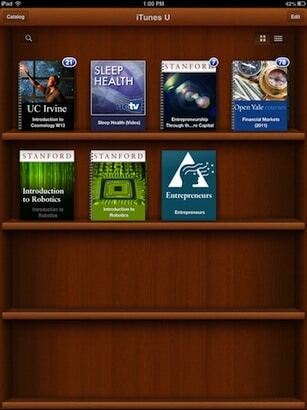 iTunes U has a similar look and feel as iBooks. You have the Library view where you store the courses you subscribed to and the Catalog view where you can search for new courses from different universities. Tap on the Catalog button on the top left corner to see what is available. 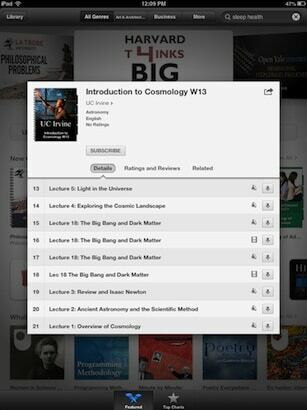 Here you can swipe left or right, up or down to see the different courses. Tap on any course that interests you to see more details. If you want to get the course, tap on the Subscribe button, then tap the Get Course button. Tap on the Library button. Now you are back in your private Library view. The course(s) you previously subscribed to appear on the bookshelf. Now we are getting down to the fun part which is actually viewing the courses! Tap on the cover of the course you would like to access. A binder with different tabs appears. Tap on the materials tab and tap on the arrow down for the class you would like to download. When the download finishes you can hear or watch the class. This is very exciting! You can listen or watch a class of your liking from a prestigious university while at home cooking or in a coffee shop! Isn’t it amazing? 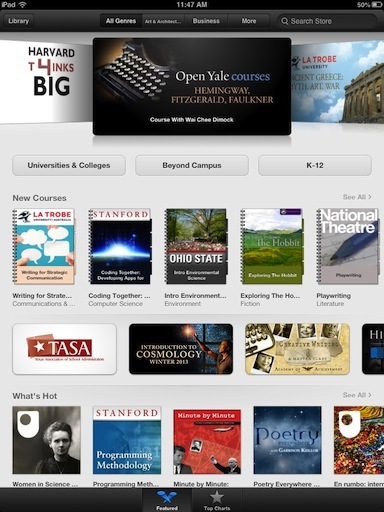 Have you seen any iTunes U courses worth recommending? Please let me know by posting a comment below.